All that remained of Ranger was flights 6 through 9. All that remained of the original scientific equipment were the television cameras—the visual imaging "experiment." Some months before, in early 1963, the RCA television system for the Block III Rangers had been modified to improve its prospects for taking pictures of the moon's surface. And about the same time, for the Bight of Ranger 6, certain organizational changes had been introduced in the management of the crucial visual imaging effort. 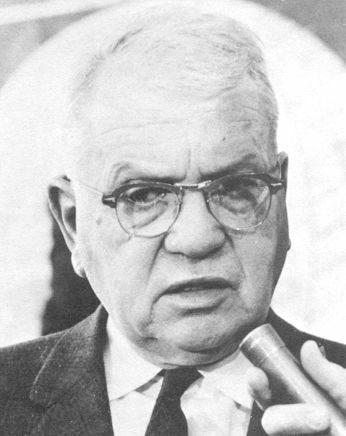 JPL space sciences manager Meghreblian appointed Charles Campen, an engineer and physicist who had helped establish the Aeronautical Chart and Information Center for the Air Force, as the Block III space sciences project representative in Schurmeier’s Ranger Office. 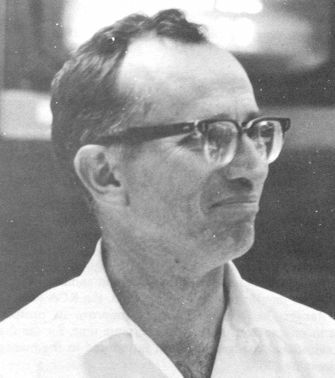 Thomas Vrebalovich, an aeronautical engineer with his PhD from Caltech, who succeeded Harold Washburn as project scientist, assisted and represented the NASA-appointed TV experimenters full-time at JPL. 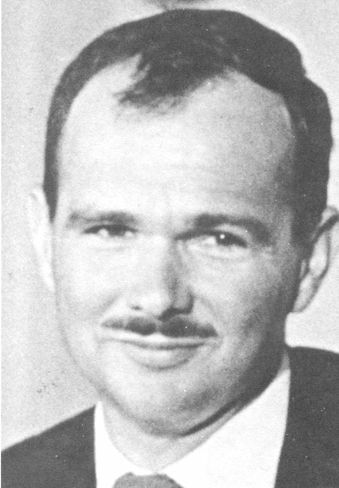 Raymond Heacock continued to serve as the space sciences project engineer, making certain that the television system met the requirements specified by the experimenters. 1 All three provided increased support at JPL for Ranger science activities. But establishing an easy working relationship among project engineers and scientists, the three men quickly learned, was not so simple. Ranger’s television experimenters remained in a novel and, in the view of some, not altogether desirable position. Collectively, they were a "team" of experimenters rather than sole proprietors of individual instruments.2 Although chartered to support them, Campen, Vrebalovich, and Heacock acted as intermediaries, buffering relations between the experimenters and Schurmeier’s project office. RCA designed, built, and tested the "experiment" itself, which was of course the television system, under the supervision of JPL, thereby removing its development from the direct control of the experimenters. Project engineers even calibrated the optics. Thus, unlike their colleagues who designed and supervised the fabrication of spectrometers or. magnetometers under contract to NASA, Ranger’s visual experimenters were left with few responsibilities save those of specifying attainable imaging characteristics at the outset, selecting the targets of interest on the moon before each flight, and -they hoped - analyzing the pictorial returns afterwards. The promised activity deeply troubled Schurmeier in Pasadena. He had his hands full requalifying the Ranger flight components and dealing with those problems already surfacing in the redesigned RCA television system.6 With the design frozen, no time remained to consider any "independent" assessments by the experimenters. NASA could rename the experimenter team and expand their duties, but, Schurmeier advised Cunningham, to avoid complications Headquarters should carefully define the experimenters’ role in relation to the project manager-and do so without delay. Though an important step, naming the team of experimenters hardly solved the problem of knitting a solid relationship between the team and the project. The pertinent NASA General Management Instruction did not contain the terms "principal investigator" or "coexperimenter" and, hence, offered little guidance. Under the terms of another Management Instruction, Schurmeier himself had the responsibility and authority to direct Project Ranger. 11 The precise roles and prerogatives of a principal investigator and his coexperimenters within the wide umbrella of Schurmeier's authority had to be settled - before the flight of Ranger 6. The experimenters as well as project engineers agreed that revision of the management instructions guiding flight projects and their scientific activities was urgently needed. But insufficient time remained to accomplish that difficult feat. Kuiper, who had been unwilling to accept the statement of role for the principal investigator formulated in his absence, now agreed with Schurmeier that everyone should meet and negotiate a "Memorandum of Agreement" to establish his respective responsibilities. Such a document would define responsibilities of the project office, the NASA Headquarters program office, and the experimenters. It would be ratified by each group, signed by a representative of each, and serve to order their relationships for the duration of Project Ranger. On July 31 and August 1 Kuiper, Cunningham, and Schurmeier met at JPL and hammered out a draft agreement. 12 With minor alterations, it was signed by all three men on September 11, 1963. 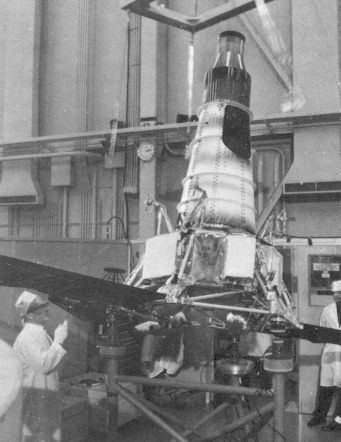 By early December, project engineers had put the finishing touches on the Ranger 6 spacecraft and its six television cameras (Figure 76). All of the critical diodes had been replaced and systems tests completed in good time to meet the lunar launch period extending from January 30 through February 6, 1964. 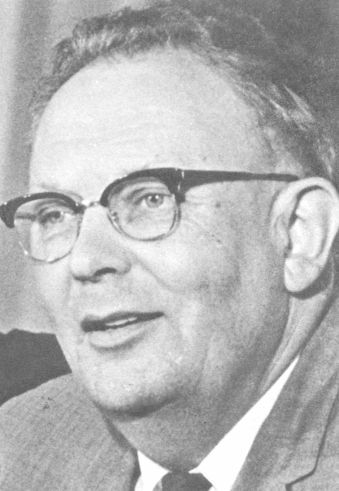 On December 6, Pickering wrote to Newell, informing him of the progress made and suggesting that NASA Headquarters "appoint a small review group, independent of JPL, to examine the entire Ranger 6 system...," including the launch vehicle and the Deep Space Network, and to certify its flightworthiness. A group composed of members of the Kelley Board, Pickering said, would meet the requirement of independence and also "minimize the amount of time required of the Ranger Project staff [to acquaint them] with the details of the project." 15 A cachet from such a board, he recognized, would not only serve to verify JPL’s own findings but provide insurance against political attacks should Ranger 6 also meet with disaster. The letter arrived in Washington on Monday, December 9, at the beginning of an extremely busy and crucial week for the Office of Space Science and Applications. Given available and anticipated resources, Newell, Cortright, and Nicks had to decide on those flight projects to be continued, started, or terminated - decisions that would lead to the cancellation of Ranger Block V by Friday. An evaluation of the flightworthiness of Ranger 6 was important but at that moment it could not compare with charting the future course of NASA’s lunar and planetary programs then underway. 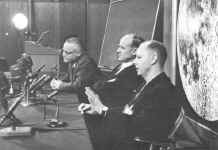 The leaders of Space Science and Applications may also have sensed the political ramifications of Pickering’s request Whatever the case, Newell decided against a special NASA review board, and instructed Cunningham and his assistant Walter Jakobowski to represent Headquarters at the Ranger 6 flight acceptance review meeting. While the spacecraft and launch vehicle moved toward Cape Kennedy, 18 Ranger’s scientists selected its photographic target on the moon. They consulted Apollo representatives at the Manned Spacecraft Center in Houston on the choice, Vrebalovich recalled, but "learned that the design of Apollo’s landing gear was already frozen;" anything space science might find out about lunar surface slopes in 1964 "could only confirm or deny that design." Apollo’s engineers in Houston "frankly didn’t care where we put Ranger 6 ... so the first choice of a target was our own." 19 In October 1962 Apollo officials had succeeded in their claim to support from NASA’s unmanned lunar missions. Their assistants in Houston now seemed entirely indifferent to the potential scientific and engineering product of Project Ranger, making of that claim a mockery. In large measure, the Ranger scientists based their choice of a target on the lunar lighting conditions to be encountered during the January-February launch period. All of the Block III television missions had to be directed to areas on the moon near the terminator, or shadow-line, where the best contrast for picture-taking was to be found; however, there was a threshold. If a target was too near the terminator, the light would become so poor that closeup pictures were useless. Somewhere, in a north-south band parallel to the terminator, there existed an "ideal" impact distance that guaranteed the best contrast for television photography. The testing of these components concluded on January 24, 1964, with a final operational readiness test. Both normal and abnormal flight conditions had been simulated, engineers subjected to unexpected equipment failures and communications breakdowns, and emergency procedures perfected. Personnel at the overseas tracking stations and the JPL Space Flight Operations Facility performed well; 24 the deep space net was judged ready to track and command Ranger 6 in every foreseeable situation. Unquestionably, at the beginning of 1964, Ranger 6 was especially important to Gerard Kuiper and the Ranger experimenters eager for a closeup look at the moon. It was also specially significant to Congressmen anxious for an American lunar "first" after twelve previous failures; to a Democratic President, who insisted that the nation's defense and space capabilities were second to none; and to Homer Newell and his associates in the Office of Space Science and Applications, who sought redemption in a flight success before the fiscal 1965 budget went to the Hill early in February. * And it was a special mission for Pickering and his colleagues in Pasadena, who were determined to erase the five-flight "Ranger black mark" on the otherwise untarnished escutcheon of Caltech’s Jet Propulsion Laboratory. * Indeed, in January 1964 NASA officials hastily directed that Ranger 6 "be called Ranger A prior to launch. Similarly, what have been Rangers 7 through 9 ... will be called Rangers B through D. If this Ranger is successfully launched, it will be named Ranger 6" (NASA document, Information Plan Ranger A; 2-1800). This nomenclature was generally ignored by the news media and, to avoid confusion, it is not used here. Commenting on the confusion anticipated, Life magazine observed tartly: "Instead of numbering all the Rangers consecutively, thus keeping accurate count of the failures, [NASA officials] designated the next one Ranger A instead of Ranger 6. If it failed, the next try would he Ranger B. Only when the launch came off successfully would it be called Ranger 6. By this trick they hoped to soak people’s memories in alphabet soup to convey the impression that there had been only five failures before the final success" (James Hicks, "Many A Slip Twixt Earth and Moon - And Measles Too," Life, August 14, 1964, p. 36a). Launch operations began in the early morning darkness on Thursday, January 30, 1964. The countdown proceeded smoothly as Schurmeier and Cunningham observed the completion on time of each benchmark from their command post in Hangar AE. 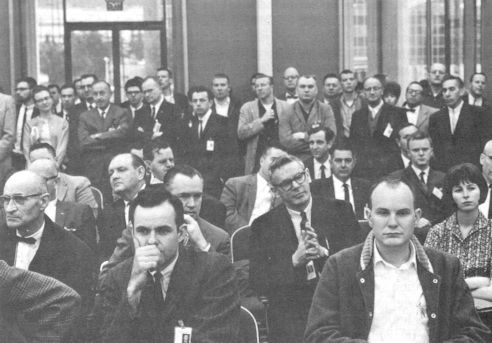 Communications lines across the country permitted launch operations and immediate postlaunch events to be monitored also at the JPL Space Flight Operations Facility in Building 125, and there, William Pickering, Robert Parks, and Gordon Kautz listened attentively to the proceedings. A new room upstairs in the JPL control center, carefully fitted out to meet the needs for viewing and analyzing photographs of the moon, awaited the momentary arrival of Ranger’s experimenters. The Florida dawn revealed an overcast sky and the stirring of a gentle onshore breeze. The prognosis for the weather from sea level through the stratosphere was, nevertheless, favorable. The count reached zero at 10:49 am EST, and the Atlas mainstage engines ignited. Those nearby heard the familiar thunder and felt the reverberations as Atlas 199D and its precious cargo disappeared into the overcast. Telemetry data flowing into the Florida command post and the control center in Pasadena were entirely favorable. Right on course in the first leg of the lunar mission, the Atlas performed flawlessly, certifying the effort previously invested by Himmel and his Agena team. But two minutes after launch, upon shutdown and separation of the Atlas mainstage engines, project officials were startled to observe the telemetry monitoring the RCA television system in Ranger 6 unaccountably turn on and, sixty-seven seconds later, just as inexplicably turn off again. While the Atlas continued its programmed chores through burnout Schurmeier and Cunningham scrutinized the Ranger telemetry returns. All of the spacecraft's subsystems appeared to be operating satisfactorily, and the tension eased. Downrange, 160 kilometers (100 miles) above earth, the rocket engine of Agena B 6008 ignited for the first time, inserting the vehicle into an elliptical earth orbit. As the Ranger-carrying Agena swung eastward over the South Atlantic twenty-five minutes after launch, the second burn was recorded. The ensemble, now moving at 11,820 meters per second (24,270 miles per hour), rose above the horizon of the South African Tracking Station at 11:19 am EST, and Ranger 6 separated from the second-stage Agena launch vehicle. The television telemetry, South Africa reported, had turned on properly - no other malfunctions could be detected. Within minutes Ranger 6 extended its solar panels and high-gain antenna, acquired the sun and earth, and stabilized in attitude. Wary project engineers in Florida and California began shaking hands - once again NASA and JPL had an operating Ranger on its way to the moon. Schurmeier left the command post and caught a plane for the West Coast, arriving at JPL late in the afternoon. There he met with Robert Parks, Ranger Flight Operations Director Patrick Rygh, and other members; of the project staff to consider plans for the midcourse maneuver and, among other matters at hand, discuss the curious telemetry events at launch. Initial calculations showed that the Atlas-Agena guidance had functioned in near-perfect fashion. Ranger 6 was traveling a path only a few thousand miles wide of the intended point of impact, an error well within the correction capability of Ranger’s midcourse motor. After engineers confirmed its precise course, midcourse maneuver commands would be prepared and transmitted. But the question of the telemetry malfunction remained unanswered. Had the event adversely affected the television system? Telemetry now arriving at the Space Flight Operations Facility plainly stated that normal conditions prevailed. To perform a checkout now, Schurmeier would have to order the entire television system turned on. And, if for some reason the system failed to turn off, the battery-driven television cameras would be left without power when Ranger 6 reached the moon. Schurmeier and his lieutenants weighed the evidence and agreed: such a test with its attendant risks was unwarranted; the mission would proceed according to the flight plan. Early Friday morning flight controllers verified and transmitted the commands for a midcourse maneuver, instructing Ranger 6 to adjust course toward its lunar target in the Sea of Tranquility. The spacecraft responded at the designated time, pitching and rolling into the specified attitude, and the midcourse motor burned properly. A few minutes later onboard sensors reacquired the sun and earth, and, still speeding moonward, Ranger 6 resumed normal cruise operations. Another milestone had been successfully passed. Pleased members of the orbit determination group went to work at JPL analyzing the new trajectory. Except for the single anomaly during launch, it was so far a textbook flight. As Ranger 6 approached the moon on February 2, Cunningham, Schurmeier, and Rygh reviewed the actions to be taken at lunar encounter. 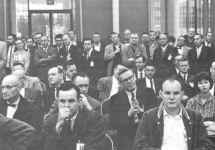 In an adjacent room, Pickering and Parks were joined by Newell and Cortright from NASA Headquarters; all watched the activity on the floor of the control center and listened intently to Richard Heyser at the Goldstone Tracking Station announce the time remaining and describe the events to be completed. Representatives of the news media and other project personnel in the JPL auditorium listened to Walter Downhower. Chief of the Systems Design Section, Downhower had volunteered to perform Heyser’s function publicly as the "voice of mission control" for Ranger 6. In a few minutes he was to be the focus of national attention as all awaited receipt of the first closeup pictures of the moon. The velocity of Ranger 6 increased as it plunged towards the Sea of Tranquility. Trajectory data had revealed that the machine would impact within a few miles of the planned target. Analysis of the spacecraft attitude showed that the alignment of the camera axis relative to the moon was within acceptable picture-taking tolerances. Schurmeier and Rygh discussed the option of a terminal maneuver to improve the resolution of the final pictures with Gerard Kuiper and the Ranger coexperimenters. So close to success, the scientists elected not to attempt it. They would not chance a possible last-minute malfunction, Accordingly, Schurmeier ordered the two full-scan television cameras and their associated transmitter turned on automatically by the TV backup clock timer, and the four partial-scan telephoto cameras and their transmitter by a real-time command from the ground. At impact minus eighteen minutes the spacecraft dutifully signaled that the two full-scan cameras had begun a five-minute warmup period. A few minutes later it flashed similar word for the four partial-scan cameras. The two sets of cameras were to switch automatically to full power and begin transmitting pictures at impact minus thirteen and ten minutes, respectively. Personnel at the Goldstone Tracking Station switched on the video receiving equipment. "Thirteen minutes to impact," Downhower announced from his broadcast booth to a waiting world, "there is no indication of full power video." Then, after a pause, amid growing murmurs in the audience below him: "ten minutes to impact, we are still awaiting transmission from the spacecraft of full power video." From the JPL control center Schurmeier hurriedly directed that backup commands be transmitted from Goldstone to the spacecraft in an attempt to turn on the television system. Minutes later, however, Heyser reported no confirmation of the action from the otherwise chattering Ranger 6. A final command also proved futile. In the JPL auditorium, Downhower continued to report the time and, with growing anxiety, repeat the phrase: "We still have no indication of full power video." The sing-song tones of the Ranger 6 analog telemetry which filled the auditorium at JPL abruptly ceased. "We have our first report of impact," Downhower exclaimed at 1:24 am PST on February 2, and, for the last time, "still no indication of full power video". Stunned officials in Washington recoiled at the next words piped into the auditorium at NASA Headquarters when a technician inadvertently switched lines: "Spray on Avon Cologne Mist and walk in fragrant beauty..." 29 In Pasadena, Cunningham pushed his chair away from the console in the control center and stood up. "I don’t believe what's happened," he said, repeating the words again and again as he left the room looking straight ahead. Pickering, who had walked onto the floor shortly before impact, turned to those nearby, declaring "I never want to go through an experience like this again-never!" Schurmeier wondered silently to himself how many more project managers Ranger might yet claim. Across the Laboratory a subdued group of newsmen and employees began to stir inside von Karman Auditorium. Walter Downhower relaxed his grip on the microphone, arose from his chair, and went home. At least he could avoid the postflight press conference. Logged as the twelfth successive American lunar flight failure, Ranger 6 blemished an impressive record of space successes cited by President Johnson a few days before. It also opened a week in which NASA officials appeared before Congress to testify in favor of a $5.3 billion budget - much of it earmarked for manned and unmanned lunar exploration - for fiscal year 1965. Under these circumstances, in the days immediately following, the news media were most temperate in their public accounting of the disaster. The Ranger spacecraft was acknowledged to have performed flawlessly even if the television cameras had failed. 1. JPL Interoffice Memo from Raymond Heacock to Distribution, subject: "Ranger TV System Review Meeting," February 26, 1963, p. 2 (2-1550). 2. Interview of William Cunningham by Cargill Hall, March 6,1968, p. 4 (2-474). 3. Letter from Homer Newell to Harold Urey, April 25, 1963 (2-2290); see also, letter from Harold Urey to Homer Newell, April 5, 1963 (2-2335). 4. See "Space Science and the Original Ranger Missions" in Chapter Four of this volume. 5. 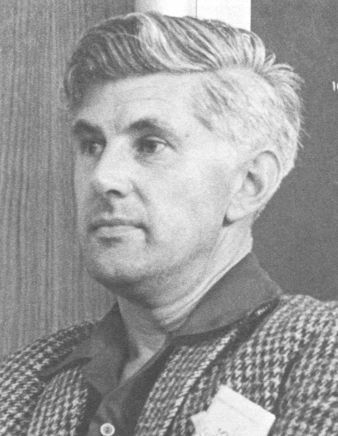 Letter from Gerard Kuiper to William Cunningham, June 18, 1963 (2-418b). 6. See "Requalifying Ranger: Progress and Problems" in Chapter Twelve of this volume. 7. NASA memorandum from William Cunningham to Oran Nicks, subject: "Role of Ranger TV Principal Investigator," July 10, 1963 (2-2339). 8. JPL Interoffice Memo from Harris Schurmeier to William Pickering, subject: "TV Experimenter Situation for Ranger, " July 11, 1963 (2-418a). 10. NASA memorandum from William Cunningham to Homer Newell, subject: "TV Experimenters for Ranger Block III, " July 19, 1963 (2-234 1a); letter from Homer Newell to Gerard Kuiper, July 19, 1963 (2-2341b). 11. NASA Management Instruction No. 37-1-1, subject: "Establishment and Conduct of Space Sciences Program-Selection of Scientific Instruments," effective April 15, 1960 (2-447), see "Space Science and the Original Ranger Missions" in Chapter Four of this volume; and Management Instruction No. 4-1-1, subject: "Planning and Implementation of NASA Projects," issued January 19, 1961, see "Reorganizing for Ranger" in Chapter Two of this volume. 12. Handwritten comment on the Memorandum of Agreement, draft, Harris M. Schurmeier, September 6, 1963 (2-1386). 13. Memorandum of Agreement of September 11, 1963, as reprinted in Appendix A of Ranger Block III Project Development Plan (Project Document 8. Pasadena, California: Jet Propulsion Laboratory, California Institute of Technology, October 31, 1963) (2-13); reproduced in Appendix E of this volume. 14. The final details were established in the correspondence between JPL and Headquarters; see the letter from Oran Nicks to Robert Parks, November 20, 1963 (2-286); letter from William Pickering to Homer Newell, November 27, 1963 (2-194); and letter from Homer Newell to William Pickering, January 8, 1964 (11-98). They were embodied in the revised NASA General Management Instruction 37-1-1A of April 29, 1964. The Office of Space Science and Applications reorganized the science function in its program offices in February 1964; see NASA - memorandum from Oran Nicks to SL Staff, subject: "Management Reassignments," February 17, 1964 (2-1490). 15. Letter from William Pickering to Homer Newell, December 6, 1963 (2-195). 16. Letter from Harris Schurmeier to William Cunningham, December 19, 1963 (2-1687); JPL Interoffice Memo from Max Goble to Robert Crabtree and James McGee, subject: "Test Phase Report 6, October 7 through December 18, 1963," December 18, 1963 (2-1686); also JPL Interoffice Memo from Allen Wolfe to Harris Schurmeier, subject "RA-6 Acceptance Meeting, " December 30, 1963; see also " Redesigning for Improved Reliability " in Chapter Twelve of this volume. 17. NASA, Briefing for the Administrator on Possible Expansion of Lunar and Planetary Programs, December 2, 1963, p. 84 ( 5-675). 18. On November 28, 1963, President Johnson announced the establishment of the Kennedy Space Center at Cape Canaveral, and that Cape Canaveral shall be known hereafter as Cape Kennedy." Astronautics and Aeronautics, 1963 (NASA SP-4004. Washington: National Aeronautics and Space Administration, 1964), p. 45 1. 19. Interview of Thomas Vrebalovich by Cargill Hall, June 11, 1974, pp. 4-5 (2-2465). This was confirmed by NASA Associate Administrator for Manned Space Flight George Mueller. The lander design, he informed the House Committee on Science and Astronautics, "is in fact frozen at the present time. We are going to go ahead and build it. "United States Congress, Senate, Committee on Aeronautical and Space Sciences, NASA Authorization for Fiscal Year 1965, Hearings before the Committee, 88th Congress, 2nd Session, on S. 2446, 1964, Part 2: "Program Detail, " p. 489. 20. See JPL Interoffice Memo from Donald Willingham to Distribution, subject: RAFO Trajectory Constraints, " October 4, 1963; and Thomas Rindfleisch and Donald Willingham, A Figure of Merit Measuring Picture Resolution (JPL TR 32-666. Pasadena, California: Jet Propulsion Laboratory, California Institute of Technology, September 1, 1965). 21. Interview of Vrebalovich by Hall, June 11, 1974, pp. 3-4 (2-2465); seen "Making a Case for More Rangers" in Chapter Thirteen of this volume for the mission objective; the Block III objective is also reprinted in Ranger Block III Development Plan, p.1-2 (2-13). 22. JPL Interoffice Memo No. 200 from William Pickering to Senior Staff, Section Chiefs, and Section Managers, subject: "Role of the Assistant Laboratory Director for Tracking and Data Acquisition, "October 2, 1963 (2-273); for early developments in this area, see Chapter Five. 23. JPL Interoffice Memo No. 218 from William Pickering to Senior Staff, Section Chiefs, and Section Managers, subject: "Establishment of the Deep Space Network," December 24, 1963 (2-227). 24. Space Programs Summary No. 37-26, Volume III for the period January 1, 1964, to February 29, 1964 (Pasadena, California: Jet Propulsion Laboratory, California Institute of Technology, March 31, 1964), p. 5. 25. Space Programs Summary No. 37-26, Volume I for the period January 1, 1964, to February 29, 1964 (Pasadena, California: Jet Propulsion Laboratory, California Institute of Technology, March 31, 1964), p. 11; see "Launch Vehicles Revisited" in Chapter Twelve of this volume for the NASA changes in launch operations. 26. NASA, OSSA Review, January 23,1964, pp. 41-42 (2-1505). 27. JPL Interoffice Memo from Harris Schurmeier and Robert Parks to All Laboratory Personnel, subject: "Ranger A Flight Activities (alias RA-6, shortly to be RA VI), "January 27, 1964 (2-1808). 28. Marvin Miles, "Ranger Heads Straight for Target on Moon," Los Angeles Times, February 1, 1964, Part 1, p.1; William H. Pickering as quoted by Earl Ubell, "To the Moon, Hoping for a Smash Success, " New York Herald Tribune, January 31, 1964. "It was, " the Tribune ventured, "about all he could say considering the history of the project." 29. 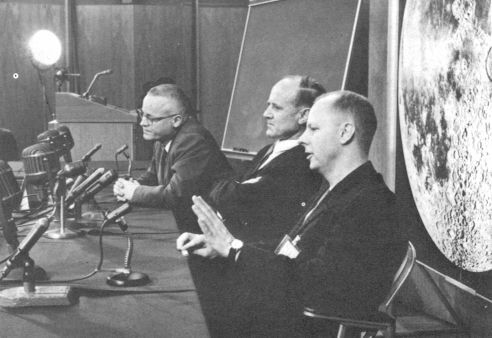 NASA News Release, subject: "News Conference on Ranger VI Impact on Moon," February 2, 1964, p. 9 (2-2509). 30. Ranger 6 flight events described in ibid. ; also, interview of Vrebalovich by Hall, June 11, 1974, p. 26 (2-2465); Ranger 6 Log, January 30-February 2, 1964 (2-924); Space Programs Summary No. 37-26, Volume V1 for the period January 1, 1964, to February 29, 1964 (Pasadena, California: Jet Propulsion Laboratory, California Institute of Technology, March 3 1, 1964), pp. 1-2; Space Programs Summary No. 37-26, Volume I, p. 2; Nicholas A. Renzetti, Tracking and Data Acquisition for Ranger Missions 6-9 (JPL TM 33-275. Pasadena, California: Jet Propulsion Laboratory, California Institute of Technology, September 15, 1966), p. 10; Ranger 6 Failure Analysis and Supporting Investigations (JPL Engineering Planning Document 205. Pasadena, California: Jet Propulsion Laboratory, California Institute of Technology, March 27, 1964); and Marvin Miles, "U.S. Photo Spacecraft Races Toward Moon" Los Angeles Times, January 31, 1964, Part I, p.1. 31. United States Aeronautics and Space Activities, 1963: Report to Congress from the President of the United States, January 27, 1964.